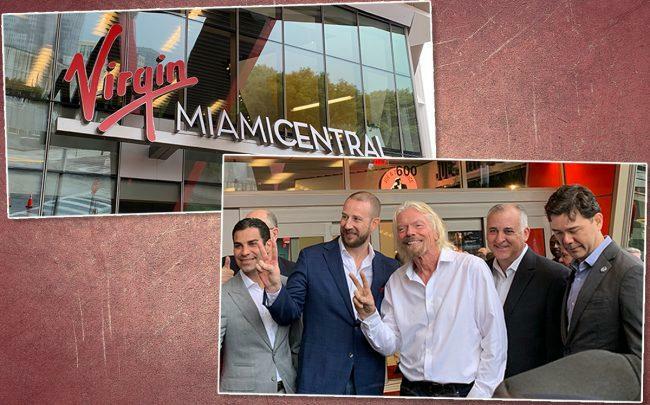 Sir Richard Branson promised to “sprinkle some Virgin magic” on Brightline at the official unveiling of the renamed Virgin MiamiCentral on Thursday. The Virgin Group founder was joined by Virgin Trains USA President Patrick Goddard, Miami Mayor Francis Suarez and other city and county officials at the mixed-use train station previously called MiamiCentral. The rebranding was revealed as the high-speed rail announced it secured $1.75 billion in high-yield bonds from private investors to fund its growth. “We’re really excited that Virgin Trains has raised the money to build the track all the way to Orlando,” Branson said. He said the train formerly called Brightline will eventually connect Miami International Airport to PortMiami, where Virgin Voyages is planning a new 100,000-square-foot terminal. Branson also hinted at eventually building a Virgin Hotel in Miami. The Bond Buyer first reported on Wednesday that Virgin Trains USA raised the bond financing, which is secured by a first priority lien on assets. The closing is set for April 18. Morgan Stanley is underwriting the bonds. The proceeds will be used to extend Virgin Trains from West Palm Beach to Orlando, to refund the $600 million of bonds issued in 2017, reimburse costs and more. The company is also seeking the Florida Development Finance Corp.’s approval to issue another $950 million of private activity bonds to keep funding the project, according to the Bond Buyer. Virgin Trains, which is backed by the private equity firm Fortress Investment Group, launched service last year between Miami, Fort Lauderdale and West Palm Beach. The company has also built commercial and residential buildings at its South Florida stations, which has spurred nearby investment from other developers. MiamiCentral opened last year, and includes the office buildings 2 MiamiCentral and 3 MiamiCentral, and an apartment component that’s under construction. A food hall is also expected to open soon at the train station. Tri-Rail will eventually connect at MiamiCentral, crossing over onto Florida East Coast Railway lines at Northeast 79th Street. In February, the company postponed its initial public offering, which it had said could be worth up to $619 million.